The Mobile Speed Update Has Arrived! We talked about it until we were blue in the face, but now it's finally here... The Google Speed Update! Despite the panic that often surrounds these sort of things, the actual impact on most sites is nominal. As I discussed last month, the update only applies to the slowest sites out there on mobile. It is worth noting again that as opposed to the desktop speed factor, here, Google looks at site speed in a more nuanced manner, upgrading sites according to the level of speed improvement undertaken. Just a month after Google threw the desktop SERP upside down by essentially eliminating Video Thumbnails in favor of a new video carousel, mobile Image Thumbnails got the opposite treatment (I could have just said that mobile Image Thumbnails spiked, but my 10th grade English literature teacher would have pummeled me on Facebook). July 13th saw mobile Image Thumbnails undergo a 183% increase per our Mobile SERP Feature Tracker. Specifically, mobile Image Thumbnails went from appearing on roughly 15.5% of page one SERPs to showing on an astounding 45% of page one result pages. Upon diving into the keywords that were behind the rise of mobile Image Thumbnails, it became pretty clear pretty quickly that local search terms were driving the increase. That is, keywords along the lines of toyota dealer in denver began producing SERPs that contained the thumbnails in accordance with the July 13th increase, whereas they previously did not do so. I've been trying to pin down a systemic change in how Google goes about placing its SERP features for a few months now (as an aside, I recently put out my best take on the new SERP feature scoring paradigm). In an effort to pin down Google's more energetic use of its SERP features (some have even referred to it as a more 'aggressive' stance), I came across a unique data tidbit .... Google now pairs Featured Snippets and Local Packs far more often than the search engine used to. Now, the increase in the pairing is only significant from a relative perspective. That is, the percentage of all SERPs that contain both features still sits below 1%. However, when looking at July 2018 as compared to July 2017, there was a 928% year-over-year increase. Looking just over the past six months and the pairing propensity jumped 134%. 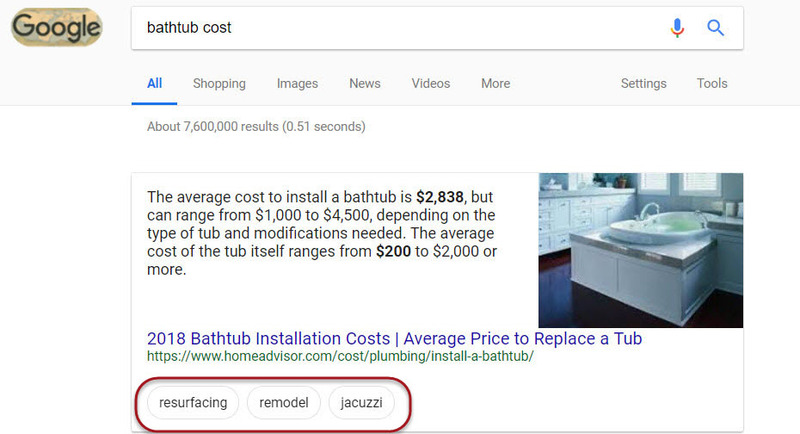 While we're on the topic of Featured Snippets, this past month we noticed that those which contain the relatively new bubble filters constitute roughly 10% of all desktop Featured Snippets (8.5% on mobile). Just thought you would like to know. A mammoth amount of things to update you on. July was an all-out barrage of major changes to the SERP ranging from Google's relationship to hotel advertising to its Search Quality Guidelines. Google loves hotels. They love testing all sorts of new filters and price discovery tools, and the like. This month was no different, except that it was. July saw Google unleash some of the most creative, some of the most detailed, some of the most impactful, and arguably useful changes to "hotels on the SERP' that we've ever seen (or in 1960's superhero vernacular, holy hotel enhancements Batman! I've always wanted to do that in a blog post). This is a monster, and if you're a hotel booking site, it's more of the scary kind of monster than the stand in awe and gape at how awesomely powerful this entity is kind of monster. Late in July Google tested what was titled as Price Insights inside the hotel Knowledge Panel on mobile. While I have not been able to replicate the test, and while it seems to be very limited, I do see this as imminently coming to a mobile Hotel Panel near you! The Price Insights is Google telling you that the deals you see inside a hotel's mobile Knowledge Panel, might not be so great. That's right, the sacred space where brands enjoy total dominance without fear of the competition has been violated, and that's huge news. In this instance, Google tells you that there are other hotels of a similar caliber that offer more competitive pricing options. The test then had Google showing you a carousel of other hotels along with their more competitive pricing. Accompanying this pertinent (or frightening information, depending on who you are), Google offered a series of nice little graphs that tell the user just how much less your other options are in a visually appealing way. The truth is, this is not the first time Google has invaded a brand's Knowledge Panel space. Mobile Local Panels often come equipped with a carousel that shows "similar" businesses, i.e., the competition. We've also seen a few tests of competitor carousels that displayed towards the top of the panel and so forth. However, what we have not seen is Google all but tell the user that the deal offered by the brand is about as desirable as Grandma's sweetbread recipe (just to be clear, sweetbread is not bread, they're cow brains or something like that.... Could a name be any more misleading?). This was also another July test, but one that I can easily replicate, even ten days after it was first spotted. In this case, Google has inserted a new Location tab inside the mobile Hotel Panel (though the information presented inside the tab is accessible in the main panel overview as well). In a nutshell, the new tab tells you how the hotel fares in regards to its proximity to points of interest. There's a deluge of data here. Users get an overall "location score" that is made up of sub-scores that include how accessible the hotel is to attractions via public transportation, or even how easy it is to get to the hotel from the airport. Via the sub-tabs, users can get an in-depth look at the local attractions near the hotel. For example, users can access a map with the top attractions pinned on it. Google supplements the map with a carousel containing each attraction within it. Each carousel card includes how far the attraction is from the hotel. This is followed by a sub-tab that gives you a look at the various transportation options available to you whether it be getting to the hotel from any of the local airports, or a look at the nearby public transportation stations. So AdWords is now Google Ads and that's nice, but when the switch happened, nothing of substance actually changed. Comes July 11 and Google announces that hotel ads are now being integrated into Google Ads (the program is in beta). The upshot here is that you can manage your Google Ads and hotel ads within the same platform. Google says that they are also launching a new "Hotel Center" within Google Ads in order to make such advertising more efficient. In a not so subtle hint, Google has started showing business owners some of the postings made by the competition. Showing up inside the Google My Business dashboard, the appearance of just how prolifically Google Posts are being employed by the competition is sure to give non-users a kick in the pants... or is it? Making Google Posts all the more relevant and all the more powerful, Google has given a business the ability to insert a phone number into a post. The new Call Now button works the way most phone options work within Google properties where a tap brings up the call pad on your phone with the business's number already inserted. I don't know why more businesses don't use Google Posts. It is one of the only opportunities to insert your own content into a SERP feature. I imagine a lot of folks don't know about it or how to use it and that's a shame. Let's skip the chitchat, there's a lot to get to here as Google made some big moves that we need to discuss. Google for Jobs, the very understated job listing aggregation that appears on the SERP, just broke through to the other side... of the Atlantic. The SERP feature will now display for job-related queries in the UK. In case you were yet aware, this means that Google will pull job listings from across the web and place them within its own ecosystem and plop these listings on the UK SERP. Outside of the UK, the feature is only available in the US, South Africa, and India. Google's most powerful media format just got a substantial new addition... ads. 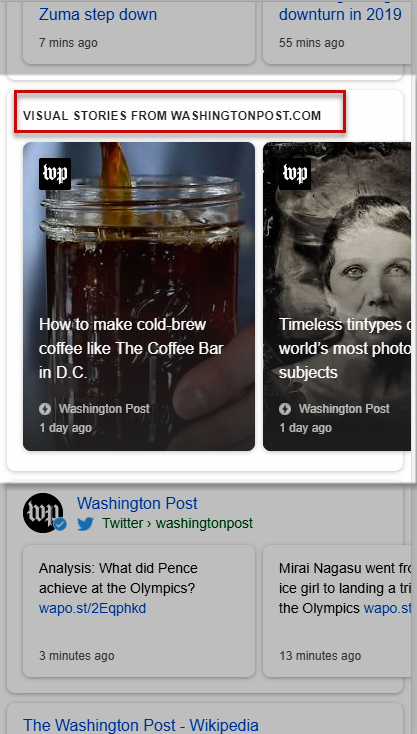 If you've never seen the feature (which at this point is mainly utilized by a select few news publishers), it is a downright awesome display of highly visual media. Now, a July 16th announcement made by the AMP Project has made the format available to all developers. What's more, the same announcement also proclaimed new monetization possibilities. I highly recommend you take a look at the format and read through the entire AMP Project announcement. Purposefully just in time for the summer, Google has revamped its Events feature on mobile. When searching for an event (think 'comedy shows near me'), Google will now allow you to save a listed event as well as get more event info and book tickets right from the SERP. In a moment of SERP synergy, Google added a tad of device symmetry to its image search (I should have been a poet). A late July test had Google showing its image search results as tiles that included image titles and the associated URL. This is how Google currently shows image results on mobile. To be honest, despite this story breaking towards the end of the month, I've personally seen Google test this format for desktop off and on over the past few months. After a long testing period, Google has abandoned the blue heading common to Local Knowledge Panels on mobile. I say common because over the past few months Google has been testing showing a white background that more or less blends the panel into the SERP. This format is now the official way Local Panels will appear on the mobile SERP. Substantially speaking, the change may mean that users no longer consciously note the panel. As a result, a user who may have bypassed the panel previously might no longer do as such, simply because the new format blends right into the page. Let me be clear here, Google does not share the sentiment... because it doesn't understand sentiment. In a Mr. Spock moment, Google revealed that its algorithm does not understand sentiment... fascinating. Moral of the story: If you're worried about some bad feelings towards your site, or snarky chatter about your site, or even links to your site that paint you in a negative light... don't necessarily, because like my 7-year-olds (I have twins), Google doesn't get sarcasm. In yet another end of the month update/change, Google has once again modified its Search Quality Rater Guidelines. Search quality raters are real people who help Google evaluate and rate the search results given to them by Google. These searchers have guidelines, appropriately called Search Quality Rater Guidelines. From time to time Google will update these guidelines, like it did on July 24th. There are a lot of new changes and ways Google's raters are now meant to evaluate a page. One of the most interesting to me is that now the guidelines ask the raters to consider not only the authority or reputation of a site per se, but that of the author of the content in question as well. Meaning, you might want to make sure the people contributing to your site have developed a good "digital name" for themselves. Are Even Bigger Things Ahead? First it was Video Thumbnails on desktop, now it's Image Thumbnails on mobile. In June it was another "hotel filter" test, now it's a brand invasive price analysis beast inside the Hotel Panel on mobile. What's next? I have no idea, but what I do know is that Google seems to be taking what I've dubbed as a more "energetic" approach to the SERP. The search engine is taking a more robust approach to altering the SERP and the features it places on it. More, it's been making larger leaps in updating and testing the elements that exist within these features, the Price Insights and Location Tab tests being case in point. What follows and how SEOs and sites will be impacted remains to be seen, but my gut says something big is coming... what does your say? Let me know! Thank you for reading the July 2018 edition of the SERP News. See you next month!